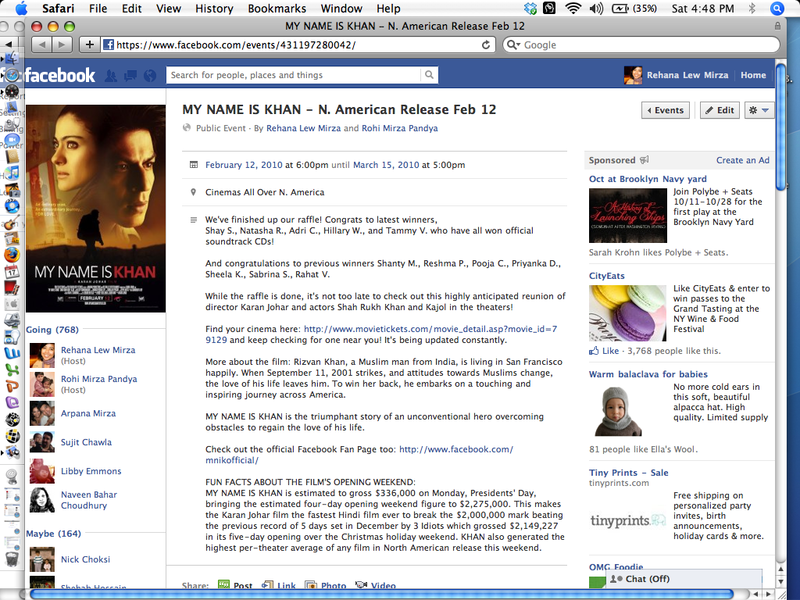 While freelancing for Box Office Guru, I was responsible for creating a Facebook campaign for the launch of My Name Is Khan. I wrote copy for both the event page as well as member messaging. I grew the event page from 50 personal friends to over 1,000 members through targeted ads, giveaway promotions, and direct messaging. The film broke the record for the biggest opening weekend ever for a Bollywood film in the US. Click here to view ad statistics. View additional headlines and copy created around online merchandising endeavors here. I have created two seasons of promotional theater trailers for New Georges, as part of my TCG Future Leaders fellowship, and am also an award winning filmmaker in my own right. I firmly believe that viral videos are necessary to spread the word and capture the interest of audiences. I am a one-stop shop – scheduling interviews, shooting video, and placing the video online so that you – and your future audiences -- have easy access to the final product. I work with each company to figure out what your needs are, and how to keep it within your budget. A.R.T./NY Gala Video -- premiered at the gala benefit, 5 day shoot with HDV camera, Rode Mic; 5 day edit session. MILK trailer -- 3 day shoot, with HDV camera, Rode Mic, & Flip camera rental to cast & crew; 2 day edit session. ANGELA'S MIXTAPE trailer -- an Audelco nominated show; this video was also featured in the New York Times. 2 day shoot with Flip camera & Hi8 camera, no external sound; 2 day edit session; Titles via LiveType. CREATURE trailer -- 2 day shoot, with HDV camera, no external sound; 3 day edit session. Also check out below the Public Service Announcement I made on awareness of Thalassemia for the Cooley's Anemia Foundation, as part of the P2 for A Cause Grant from Abel Cinetech.